I mentioned in an earlier post that my research following my In Parallel project has broadly followed two lines of enquiry: one using collage, paint and layering to explore relations between organic and human-made forms and ideas around mapping; the other is looking at edgelands in relation to the sense of home, belonging and security in a series of paintings. The former works are predominantly process-led and abstract, whereas the latter are figurative paintings. In these times of uncertainty and intolerance, I aim to raise issues with these paintings about isolationism, migration, refuge, outsiders, the other. On a camping trip last year near Ledbury, I was fascinated by a caravan parked near an old agricultural shed in a woodland which was full of discarded/stored building materials, like found sculptures. There was an edgeland or “outsider” feel to this scene. The caravan was evidently occupied, a man emerged occasionally, and there were rare glimpses of his partner, but it was ambiguous as to whether it was a permanent living space, or just a temporary visit. I was drawn to the marginal, outsider aspect. I took some photos, and made a sketch in situ, which I later made into a quick watercolour study in the studio. Following further studies, I produced a small canvas with pinkish, “scratchy” ground. I like the small scale canvas, but for the next in the series I increased the scale. 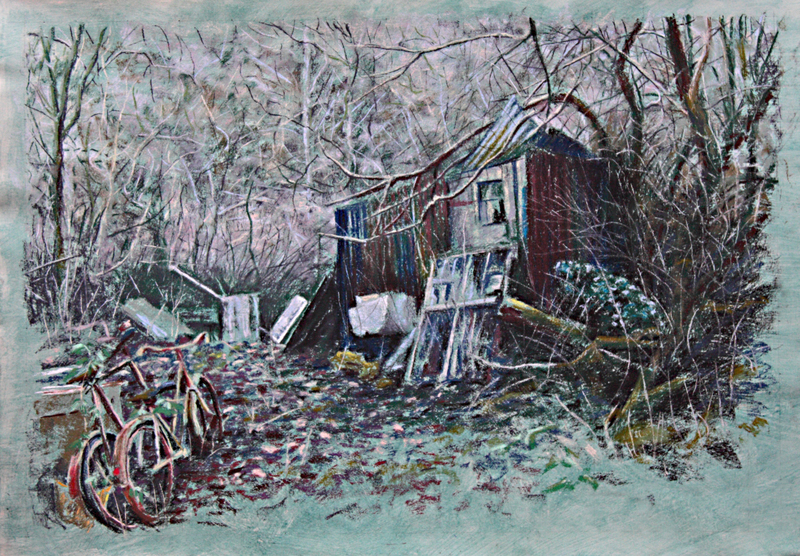 This time I worked on the wrecked cabin/caravan I found near the Coton Hill allotments site. I experimented with different coloured grounds and printed wallpaper. I was unable to source any real retro wallpaper, and didn’t have the chance to get back to the caravan to see if I could scavenge some – its probably too mouldy now anyway. I went with a slightly more restrained approach, reducing the palette, using a mix of warm and cold grey/blue/green colours. How does the painted wallpaper affect how the image is read? Are we conscious that it is more mediated, unreal, or do we just see it as part of the painting, when everything else is painted? In other studies I reduced the subject into abstract shapes and textures, and played around with different viewpoints and spatial organisation. I was looking for an impression of the interior without having to reproduce the actual layout/view. There is something about the grungy yellow brown colours and overly ornate patterning which marks the wallpaper out as originating in the late 60s/early 70s and conjures up childhood memories. Viewers have commented to me how they are be “able to remember the homeliness but smell the damp in this scene”. This is about faded, degraded nostalgia. These studies show an interesting progression towards the final painting in which I bring all the elements together. The title plays a role in interpreting this painting. I toyed originally with naming it “While you were out”, perhaps implying that this was a scene of vandalism and violence, or merely the effects of the ravages of time once the occupants vacated the place. Then it was “Get out” until a film was released under that name, so now it is “Get Away”. This also has multiple meanings, on one hand it suggests a place of refuge, escaping the world’s harsh realities, later succumbing to dilapidation and decay, while on the other hand, it could refer to a more violent attack on the occupants. I really don’t know what the story behind this cabin was – it is located down a private track, about half a mile from the edge of a housing estate, in an overgrown field adjacent to allotments and surrounded by beehives in a poor state of repair. There was a heavy atmosphere in a quiet place. So the ambiguity in the painting title is fitting.